Mount Wilhelm (German: Wilhelmsberg), 4,509 metres (14,793 ft), is the highest mountain in Papua New Guinea. It is part of the Bismarck Range and the peak is the point where three provinces, Simbu, Western Highlands and Madang, meet. The peak is also known as Enduwa Kombuglu in the local Kuman language. The mountain is on the island of New Guinea, which incorporates Papua New Guinea and the Indonesian province of Papua. It is surpassed by Puncak Jaya, 4,884 m (16,024 ft), and several other peaks in Indonesian Papua. Some sources claim Mount Wilhelm as the highest mountain in Oceania or Australia, on account of Indonesia being part of Asia. Mount Wilhelm received its name in 1888 when a German newspaper correspondent, Hugo Zöller, climbed theFinisterre Range, south-east of Madang, and named the Bismarck Range after the German Chancellor, Otto von Bismarck, and the four highest peaks of the range after him and his children: Ottoberg, Herbert-berg, Marienberg and Wilhelm-berg. Otto-berg seemed to Zöller to be the highest of the range, but it was later discovered to be only 11,600 feet (3,540 m) and the distant Wilhelmberg was much taller. It was not until August 1938 when Leigh Vial, a government patrol officer, and two Papuan New Guineans made the first recorded ascent. It was noted by Vial that even though the mountain was close to the equator, snow existed on top of the mountain at the time of ascent. 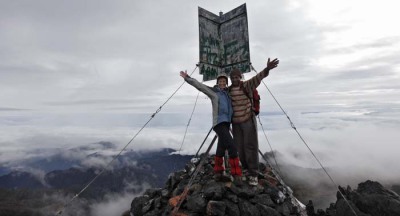 Mount Wilhelm is the most accessible mountain to climb in Papua New Guinea. There are two routes to the top. The most common route starts from the village of Kegla at the end of the road from Kundiawa in Simbu province. A harder hike and climb starts from the village of Ambullua in the Western Highlands province. The Kegla route involves climbing up and through a mountain rain forest and then along an alpine grassland glacial valley to the twin lakes of Piunde and Aunde. At Piunde there are two huts, one being an old Australian National University monitoring station and the other an 'A-Frame' hut. Though not a technical climb, various sections can be treacherous in wet weather. The climb is usually started during the night; the ascent and subsequent descent can take anywhere from nine to 24 hours. Reaching the peak at dawn allows a better chance of clear weather. The other route from Ambullua is a much harder 4-day hike.